The Calhoun-Cleburne Counties Bar Association was recently recognized with the Award of Achievement from the Alabama Bar Association for outstanding service to the public during 2011-2012. President of the local bar during this time period, Laura Ghee Alexander, noted the significance of the award and the wide participation of attorneys in various programs that prompted this honor. The events judged in awarding this included the observance of Law Day 2012, the donation to Cleburne County for erecting a Lady Justice statue on the dome of the courthouse, working with Jacksonville State University’s criminal justice program and donations of time and money to Christian Family Projects, the animal shelter and the sheriff’s Courthouse Teddy Bear Project. 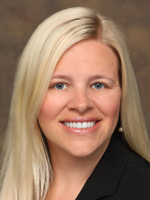 Ms. Alexander noted that the local bar has many attorneys supporting local projects and that the bar remains active in the community to support local groups and individuals in serving the needs of our area. 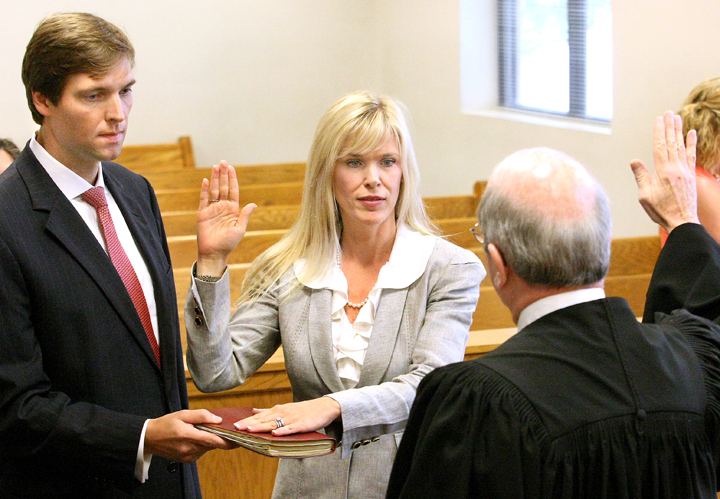 Congratulations to our Jennifer Ghee Downey on being sworn in as the Judge for the City of Anniston Municipal Court! New Anniston City Judge Jennifer Downey gets sworn in by Calhoun County Circuit Judge Malcolm Street Jr. at city hall. Holding the Bible is Jennifer’s husband Bruce Downey. As an experienced criminal defense lawyer in the Anniston, Alabama area who is passionate about securing the best outcomes for his many clients, the Ghee and Draper Law Firm explains that they have a very large range when it comes to the criminal cases that he has successfully defended. From representing clients involved in traffic offenses to potential murder charges, he Ghee and Draper Law Firm have done it all.In any circumstance, you should hire a lawyer immediately following your arrest, the Ghee and Draper Law Firm advises, because even before your very first court appearance, you have a lot to juggle and many decisions to make. It is usually in your best interest to plead not guilty, they explain, so that you can give your attorney the chance to negotiate the best possible resolution for your charge. If you plead guilty in court, then you are leaving yourself open to being punished with the maximum penalty. While your lawyer will take on the responsibility of preparing for your trial and representing you in court, there are some things that you can do to help your case as well. First, take a realistic look at what has unfolded. While they must sometimes be the bearer of bad news, the Ghee and Draper Law Firm have found that most clients understand the circumstances they are in. There also needs to be an open line of communication between you and your lawyer. The attorney that you ultimately choose to represent you needs to know the events of what happened, the crime you have been charged with, and your criminal history. In many cases, the legal trouble you have or have not gotten into in the past has a major impact on your trial, especially when a jury is involved. Beyond the preliminary aspects of relaying the details of the arrest, your personal involvement in the ongoing details of your case is completely up to you. As the Ghee and Draper Law Firm explain, some clients bring in the requested documents and leave the rest up to their attorneys to figure out. Other people want to have constant updates on how their cases are progressing. One way is not necessarily better than the other, and there is definitely a happy medium. There are varying degrees of what it means to work together with your lawyer, they say, but it is this relationship that helps achieve the best possible outcome. At the end of the day, it all really comes down to how comfortable you are with your lawyer, the Ghee and Draper Law Firm adds. You need to be able to trust your lawyer, they explain, and communication between you and your attorney is an important dynamic that can ultimately impact the results of your legal predicament. This article is for informational purposes only. You should not rely on this article as a legal opinion on any specific facts or circumstances, and you should not act upon this information without seeking professional counsel. Publication of this article and your receipt of this article does not create an attorney-client relationship.